So they look cute, they can sing! If you have more than one they harmonise with each other which is pretty cool but I think the problem with the two we got sent the songs are diabolical. I mean the green one sings 'I'm on top of spaghetti' I bet you're all thinking oh yeah that song, I know that, not. Whilst there were normal characters that sang 'twinkle twinkle' or 'Row your boat' you know songs you actually know. I hate hate hate giving negative reviews but there isn't a lot of good I can say about these other than they are cute sadly, maybe if we had characters that sang songs my four year old knows he may have come around to liking them and potentially when I'm being sent a toy to review really its Oscar who knows his thing. It is targeted at 3-5 year olds and is great to get them singing a long if they know the song that is. They do have their own language too though, if you like quirky toys you might absolutely love this, each to their own. 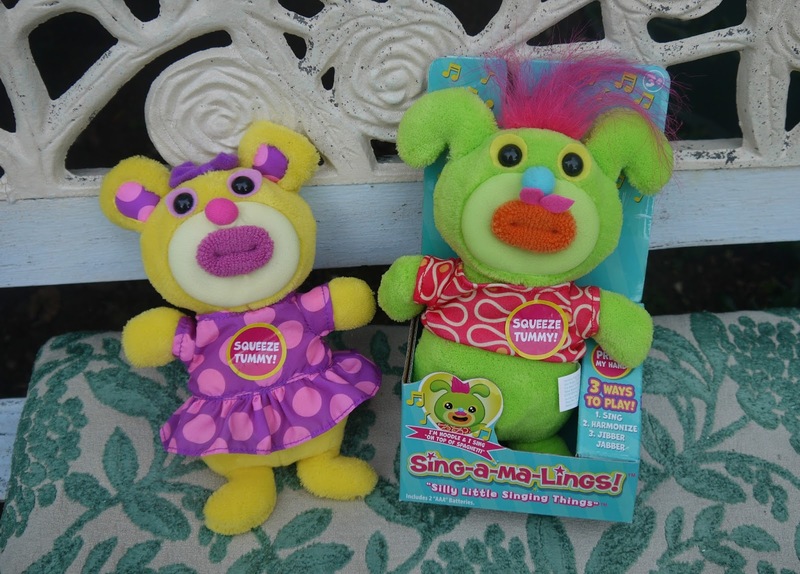 I wouldn't go out of my way to buy one personally but thats just me, the green one does have funky hair though and reminds me of my trolls I used to love. If you are a fan of these quirky guys they have a youtube channel here.